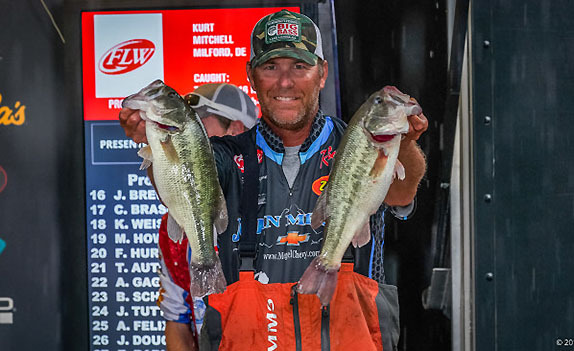 Randy Haynes, who led the Kentucky Lake FLW Tour after each of the first 2 days, left the water early on day 3 after fishing bumper to bumper for a short time with 2nd-place Jason Lambert on an offshore ledge. Lambert caught several fish during the time when they were together and Haynes departed with nothing in his livewell. It was reported on FLW Live that Lambert, who had an earlier day-1 boat draw than Haynes, had begun the tournament on that ledge, which is in the northern portion of the lake, and Haynes had fished it later in the day after Lambert had moved on. Haynes exploited it for a 26-03 stringer � the heaviest of the event through the first 2 days. 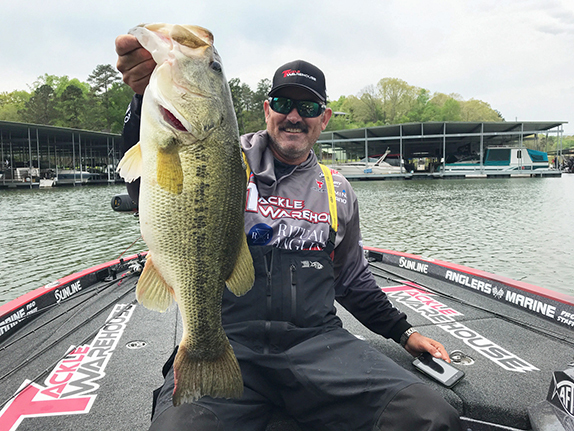 On day 2, with the boat order flip-flopped, Haynes started on the spot and remained there throughout the day while Lambert caught his 19 1/2-pound bag from a shallower area in the southern end. With the day-3 field reduced to 30 competitors, the duo staged a boat race to the spot upon take-off. Lambert arrived first, just seconds ahead of Haynes, and they began fishing virtually shoulder to shoulder. FLW Live video showed that Haynes became frustrated with the close-quarters situation, eventually telling Lambert that he could have the spot to himself. "I'm taking it to the house," he said. "I've got work to do." (Haynes owns and operates a hardwood floor installation business). There were no harsh words exchanged between the anglers in the video snippet broadcast on FLW Live. Lambert can be heard suggesting that they share the locale, which demands a specific bait presentation from a precise angle, but Haynes opted to depart and head for the launch. Reached by phone about an hour later en route to his home in Ripley, Miss., Haynes said the scenario, from his perspective, was an ethical issue. "It's more of a sportsmanship deal than anything," he said. "I'm kind of old-school and I fish because I love it, but I don't want to fish like that. It's just where the sport is now. "I was the leader and I'd pretty much sat on that spot for 2 days with nobody around me. He beat me there today because he's got a faster boat. If that's the way it's going to be, I've got other things to do. I'd rather go see my kids and do hardwood floors." 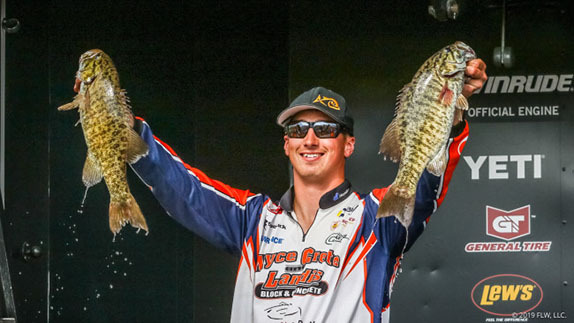 He said he plans to compete in the final regular-season event next month at Lake St. Clair. "I've got some buddies and we're going to go up there and room together and have a good time." 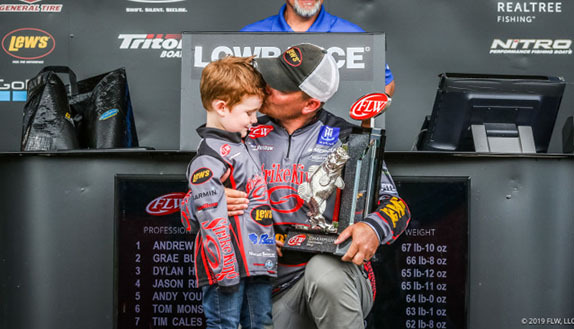 Joe Opager, FLW's director of public relations, said that Haynes' final placement for the event will be wherever his current weight leaves him � no lower than 30th. Lambert, who began the day trailing Haynes by 2-04, caught several quality fish from the spot both before and after Haynes' departure. He reportedly had about 20 pounds in his livewell when he left it at about 10 o'clock and upgraded with a fish in the 9-pound class from another location.